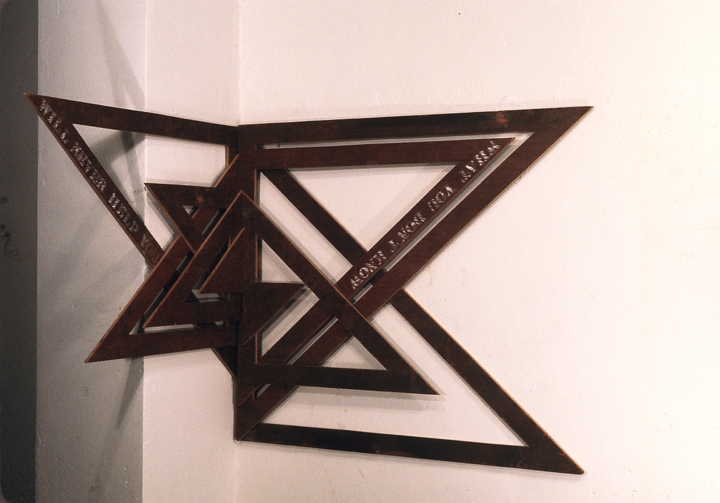 A wall sculpture was created that would be mounted near the ceiling in a room corner. A 4’ square section of badly weathered plywood was cut in 3” concentric triangles. Each triangle was lifted out of the square and remounted on the next. The effect of the piece was to attract the eye in a zig-zag pattern to a part of the room which normally received no attention. The words, “What you don’t know will never help you,” were stenciled on two triangles. H: 48 in. x W: 4 ft. 5 in. x D: 2 in.